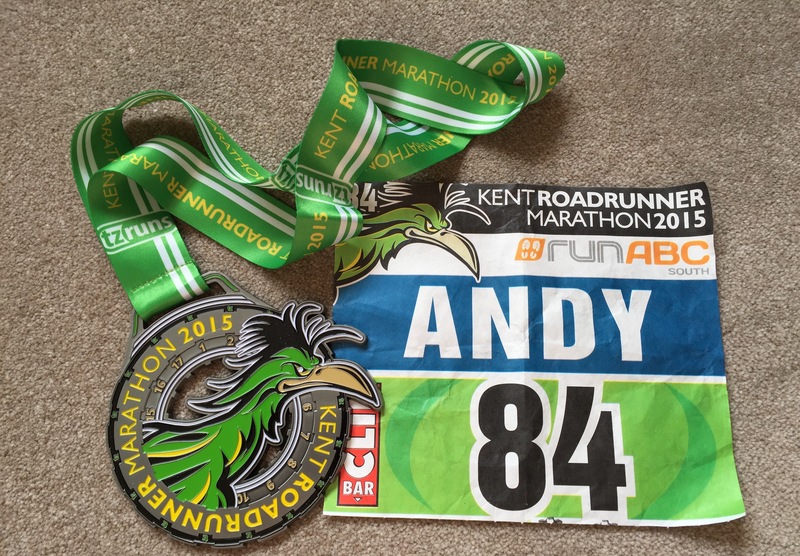 The Kent RR marathon is held in the Cyclopark in Dartford, which is around 27 miles from where I live in Essex. The marathon is unique in that runners complete 17 laps of a circa 2.5km cycling (tarmac) circuit. Now this is a Marmite conundrum, and you may either love this concept, or hate it. I personally had no real feelings about this, and after running the course found some pros and minor cons of this set-up, which I will explain duly. I arrived at the Cyclopark around 8:15am, leaving me with 45 minutes to pick-up my race pack (these are not sent out in advance) and warm-up. Fortunately, things were not too busy as there were only around 400 runners. 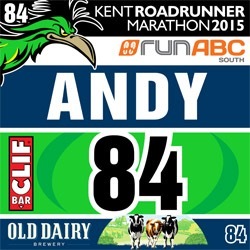 I quickly got my race-pack, attached my runing number to my vest and was soon warming up. My warm-up was not too extensive, and I simply wanted to gently ease my body into the transition between rest and exercise. I was not looking for a speedy time today, and just wanted to take it easy and enjoy the run. I was partly still on a high from getting a cracking PB of 37:08 just 5 days ago at the Bupa London 10,000, and knew that I was not marathon race ready, so there was no point in busting myself trying to go fast. I cheekily started closer to the front, but as the track was quite wide and there were only ~400 runners, I knew I wouldn’t be holding anyone up. Additionally, I am a little rubbish at pacing and my first few miles will always be a little faster anyway! I met Dan Afshar from Xempo on the start-line (who went on to finish in 2:58), and we promptly began at 9am, as scheduled. As with any event, I felt superb for the first few miles! Legs, pace and strides all felt super comfortable and I was very much in control. I bumped into David Bailey, a fellow runner from Strava, which was a nice surprise. He was super friendly and we chatted and ran together for a couple of miles, before we went at our own paces (he went on to finish in 3:14). The looped course was wavey and undulating, with a short, steep incline just before the start/finish of each lap. The track is also wide enough meaning that you won’t have much difficulty lapping and overtaking slower runners, and also won’t be holding up faster runners. Now as this is a lapped course, there are some positive and negative points associated with this. To summarise, this is what I personally liked and disliked. Seeing family and friends multiple times on your way around. Set-up your own aid station and taking regular hydration/supplements. Lots of opportunity to be photographed. Toilets/urinals at every lap provide a good safety net! Lapped nature can get a little mundane and emotionally draining. Challenging course with undulations (according to my Garmin, a total of 408m elevation!). I personally found the course to be a little challenging. When I got to 13/14 laps, just after 34km, I was wishing that I were on my last lap. Counting down the laps at the end got a little bit mentally draining, as some runners were now heading toward the finish lane, whereas I knew I had another few laps to go. This was a little demotivating, as in other marathons, you cannot see the finish until you are almost finished. In order to help you keep count, there was a screen which showed your name and the number of laps completed, every time you passed the timing mat at the start/finish line. The running commentator also gave a shout out and some encouragement, which was a nice touch. The event really struck me with how personal it was. We all had our names prominently displayed on our running bibs, allowing everyone to easily cheer each other on. The reverse runner Matt was also fantastic and a huge motivator as he came cheering past clapping his hands. I found the last few laps a little draining, but powered through. I picked up the pace on my final 1km, and finished strong in 3:39:40. No way near a PB, but this was not my aim today. 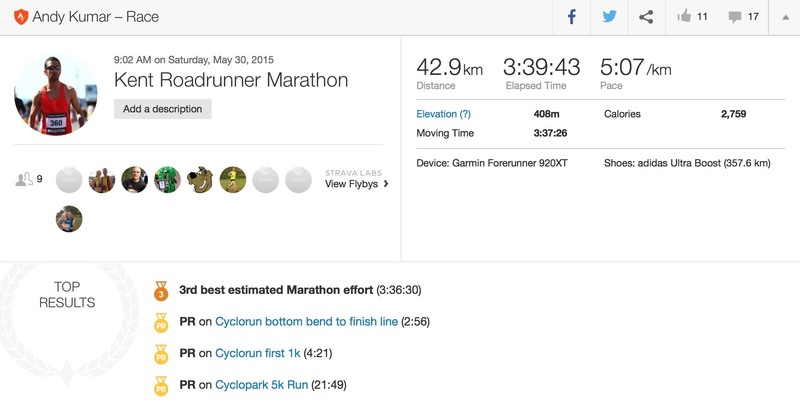 I had an enjoyable training run and just wanted to finish in under 3:45, so was pleased with my performance. I had my timing chip removed before having a huge medal placed around my neck. I also picked up a nice goody bag which was filled with lots of edible snacks, and then had a post race stretch-out and massage. The Cyclopark also has shower facilities, so it was great to be able to freshen up and change into some nice clothes so soon after the run. 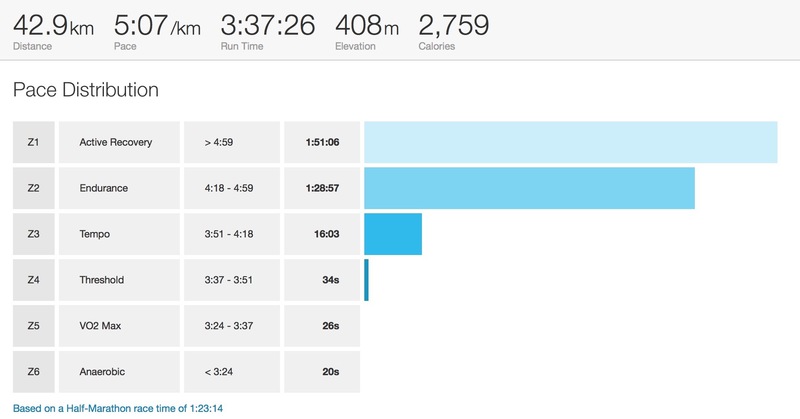 Interestingly, my Garmin 920XT recorded that I ran 42.9km (race stats below). As I touched on with the pros and cons, the option to take on electrolytes and hydration at leisure will was really helpful. Having easy access urinals at every lap meant that I could drink without fear, as at Brighton marathon I was a little more conserved with my hydration intake. I in fact did make use of the urinals (twice!) which may have taken a minute or two off my time (not sure if you wanted to know this information to be honest!). To this effect, I found that I did not cramp-up in my legs, and only felt some minor twinges after 38 kilometres. Was this due to taking on more electrolytes throughout the race, or due to running slower? My suspicions are a little of both, perhaps. I should also add that it is now 24 hours post race as I write this blog post, and although my legs are a little sore, they are holding up far better than post-Brighton. So following the race I went to Bluewater, located nearby, and had a nice lunch at Tortilla, as well as a frappuccino from Starbucks. Unashamedly, I also picked up a few Krispy Kreme donuts to have later! So all-in-all, a cracker of an event with friendly support, a huge shiny medal and awesome post-race facilities. I have already signed-up for next years event on 28th May 2016, which means that I will unfortunately have to miss the Bupa London 10,000 which is held 2 days after. I am a little disappointed by this clash of dates, but at the same time feel that I need to do myself justice on this challenging course and return next year for a significant marathon PB. Watch this space! « So I finally got my Apple Watch!